A team of Whitworth University students tied for third place at the 15th annual National Intercollegiate Ethics Bowl, sponsored by the Association for Practical and Professional Ethics and held March 3 in Cincinnati, Ohio. This is the second time in three years Whitworth has placed in the top five in the national ethics bowl. The Whitworth team competed against 31 other top-scoring teams from 10 regions across the nation. Last fall, more than 100 public and private colleges and universities competed in 10 regional bowls; Whitworth took second place in the Northwest region's bowl competition. At the national competition, Whitworth defeated teams from the University of Oklahoma, Norman, and Macalester College, of St. Paul, Minn., in the preliminary rounds and then lost a close round to the University of Maryland, College Park. The top eight of the 32 teams advanced to the quarterfinals, in which Whitworth defeated Utah Valley University. In the semi-final round, Whitworth narrowly lost to a regional rival, Montana State University, and tied with fellow semi-finalist Colgate University for third place. Other schools in attendance that finished below Whitworth in the standings included Clemson University, Dartmouth University, the University of Iowa, Samford University, the U.S. Naval Academy, and the University of North Carolina at Chapel Hill. 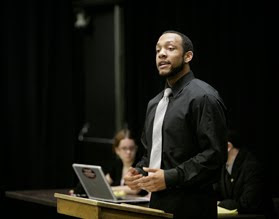 Prior to the March 3 competition, Whitworth's interdisciplinary ethical-debate team analyzed 15 ethically complex cases pertaining to topics such as the use of prison labor, computer hacking, economic development in Haiti, hospitals' hiring policies concerning people who smoke, the practice of de-barking dogs that repeatedly bark in urban areas, the connection of teacher pay to student performance, homeowners who walk away from "underwater" home loans, and the sale of caffeinated alcoholic beverages in Scotland, among other topics. "The interdisciplinary nature of the team and the students' liberal arts education through Whitworth's Core Worldview Studies Program served them well in this academic competition," says team coach Mike Ingram, professor of communication studies and associate dean for faculty development and scholarship at Whitworth. Members of the Whitworth team included history and political science major Peter Dolan, '11, philosophy major Krister Johnson, '13, philosophy and theology major Jared Lollar, '11, philosophy major Benjameen Quarless, '12, and philosophy and English major Heather Wallace, '11. The team was coached by Ingram and by Keith Wyma, associate professor of philosophy.